Looking for a great Family Vacation Spot? 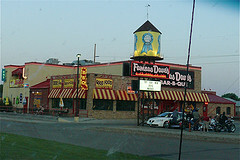 Check out the Us Vacation Spot of Bismark, North Dakota. The summer of 2011 will be memorable because Bismark had floods come through their city. It felt great boosting their economy, while having a cheap family vacation! The concession was even cheap, and the slides were super fun. Here's the link to the Raging Waters website: www.ragingriverswaterpark.com just across the bridge in Mandan. 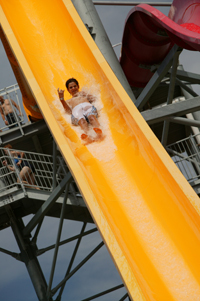 I even got brave enough to go down the yellow "drop-of-doom," as I like to call it. I am the coolest, and the bravest, parent. Once you're done at the slides, head for supper. We totally recommend Space Aliens if you have kids, and Famous Dave's for everyone! The shopping was easy and fun, especially with deals they always have. The 3D movie was cheaper than our local theater too! Go Captain America! We went in the afternoon, during the week and got the entire theater to ourselves! And they have a long, fast water-slide, hot-tub and pool. Just when we thought the kids were tired of swimming, they burned off more energy while we sat on the side with a drink, just relaxing and visiting. If you are looking for quick getaway with someone special and/or your family. It's right in this Top US Vacation Spot. And hey, if you can't drive here, head to your nearest local hotel, that has a hot breakfast and water-slides included. It will be the coolest vacation spot!